This project fits into iSEE’s Energy Transitions and Sustainable Infrastructure research themes. The results will be used to create a wealth of knowledge that will drive future energy and environmental policies, infrastructure design and management, and educational curricula. As water scarcity issues rise across the globe, both residential homes and commercial services, such as thermal power, are impacted. iSEE researchers recently published “Analyzing the Economic Value of Thermal Power Plant Cooling Water Consumption” in Water Resources and Economics, taking an in-depth look to provide decision makers with a more robust understanding of this issue. Due to tensions between power companies and individuals — and spikes in electricity pricing — exploring financially viable solutions might push sustainable progress forward. Thermal power plants have been at odds with both small (individuals) and large (such as agriculture) water users, especially during times of drought and water rationing. This analysis evaluated both long- and short-term demands including factors such as water consumption, water demand, electricity output, waste heat, and overall costs. The analysis found that efficiency retro-fitting of thermal power plants did very little to improve overall water reduction in the long-term. Authors of the study include William N. Lubega, a Ph.D. Candidate in Civil and Environmental Engineering, and Ashlynn S. Stillwell, Assistant Professor in Civil and Environmental Engineering. University of Illinois researchers are using statistical analysis to help solve drought management planning across the U.S. In March 2019, Tushar Apurv, a Ph.D. Candidate in Civil and Environmental Engineering, Ximing Cai, Professor of Civil and Environmental Engineering and iSEE’s Associate Director for Campus Sustainability, and Xing Yuan, Professor of Hydrology and Water Resources at Nanjing University published Influence of “Internal Variability and Global Warming on Multidecadal Changes in Regional Drought Severity over the Continental United States” in the Journal of Hydrometerology. The study found that global warming is likely to increase the drought severity in southeast and southwest states, making climate change adaptation necessary. All regions of the U.S. were included spanning over 100 years of data. Pacific decadal oscillation (PDO), varying water temperatures in the Pacific Ocean, and Atlantic multidecadel oscillation (AMO), a climate cycle that impacts sea surface temperatures in the Atlantic, have had strong influences on changes in drought severity over time in the Great Plains. Additionally, PDO and AMO could decrease drought severity in the Upper Midwest and Northwest if the Pacific Ocean temperatures remain cooler. “The estimation of drought severity in the short-term future based on the analysis of temporal patterns in the past and the likely changes in the drivers of droughts, as presented in this study, suggests the need for different strategies for regional drought risk management in different parts of the CONUS,” the research team wrote. 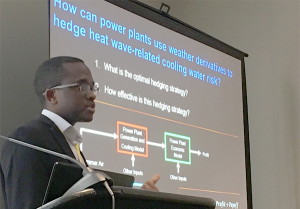 At the World Environmental and Water Resources Congress in 2017 in Sacramento, Critical Infrastructure and Transportation team member William Lubega presented his work on financial instruments for mitigating cooling water risk at power plants. The team developed a bi-level optimization method for decision making involved in interdependent infrastructural systems. The method is institutionally realistic in representing the hierarchy of decision making agents. Researchers also completed the work on quantifying the effects of droughts and heat waves on the electric power grid. 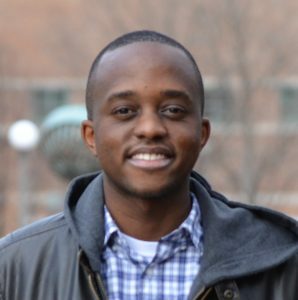 Main takeaways (based on William Lubega’s dissertation): adjustments in thermal variances at individual power plants can help maintain electric grid reliability in response to droughts and heat waves; index insurance contracts can help mitigate water-related risks to power plants; and cooling water demand is inelastic for power plants. Scientists developed a partial dynamic equilibrium transportation model to study the consumers choice of alternative vehicle models given the preferences for demand for vehicle miles traveled and their response to the policy incentives at the national scale. The model includes flex-fuel vehicles, hybrid vehicles (HBV), plug-in hybrid electric vehicles (PHEV), battery electric vehicles (BEV), and the cost and other constraints in using these vehicles given the availability of charging stations. One highlight of this study is to include the distributional characteristics of consumers’ preferences for the vehicles in the model to circumvent the “all-or-nothing” technology choice that simple linear optimization generates. By working with Ouyang’s group, the team was able to simulate consumer incentives for purchase of electric vehicles under alternative assumptions about availability and ease of charging these vehicles and goals for greenhouse gas reduction. The team developed a theoretical framework to analyze automobile manufacturers’ profit-maximizing vehicle pricing strategies under imperfect competition and Corporate Average Fuel Economy (CAFE) standards. The framework shows that manufacturers have incentives to strategically set relative prices of flex fuel vehicles (FFVs) and high fuel economy models depending on their fuel types, fuel economy, and the relative regulatory stringency each model and manufacturer faces. In addition, it shows that manufacturers overprice conventional vehicles (CVs) and low fuel economy vehicles and underprice FFVs and high fuel economy vehicles to comply with the CAFE standards — and that this relative-price alteration attenuates as market power strengthens. Researchers estimated a reduced-form price-setting equation for 4,932 vehicle models offered in the U.S. from 2012 to 2016 and found that CVs and low fuel-economy vehicles are implicitly overpriced while FFVs and high fuel-economy vehicles are underpriced. For those model years, the mean implicit tax on CVs ranged from $736 to $1,945; the mean subsidy on FFVs ranged from $10 to $1,806. The study also found that the attenuation effect through market power is heterogeneous across fuel economy and fuel type. Team members identified the major barriers of the electric vehicle (EV) market, the spatial distribution patterns of current EV charging stations in the U.S., and the spatiotemporal patterns of current EV charging stations. They also analyzed the factors on the cluster pattern of the EV stations, including non-stationary spatial relationships between EV sales (or EV densities) and other social and economic indicators. Scientists modeled interdependent transportation and power systems under dynamic supercharging demand of EVs where the travel demand and power system base load vary over time. The team formulated a systemwide total cost minimization problem for the coupled networks, and a joint pricing scheme was developed to achieve systemwide optimum for the coupled networks. Numerical experiments were conducted to demonstrate that the proposed joint dynamic pricing scheme outperforms the myopic as well as static pricing strategies. ICI team members are developing an integrated model for multilayer decision support including EV choices, investment on power systems and transportation facilities, and economic incentives under resource and environmental constraints and vehicle and energy market uncertainty. This ongoing task integrates the work from all subgroups, and the model will be applied to a region/city for EV development. In January 2018, ICI team members published a paper in the International Journal of Energy Research exploring the complex answer to a seemingly simple question: What type of electric vehicle — hybrid-electric, plugin hybrid or battery powered all-electric — best balances environmental and consumer needs? Transitioning from petroleum-fueled passenger vehicles to renewably powered ones is a widely acclaimed tactic for cutting greenhouse gas (GHG) emissions, but putting it into practice has been slow. While electric vehicles are gaining popularity, they make up a small proportion of cars on the road because their purchase and maintenance costs are high and yet their effective driving range remains low. Attempts by manufacturers to increase the driving range with more battery storage unfortunately also increases price. Cars capable of using both electric and petroleum fuel sources solve the range problem — but also have higher emissions. Tracing the emissions and costs of vehicle construction, purchase, and operation — and the emissions and costs of their possible fuel sources — ICI team members built an optimization model to analyze and rank vehicles given a certain annual range of miles driven. All the inputs they looked at are visualized in Figure 1. Generally, when cost reduction is the biggest concern, a hybrid-electric vehicle is usually best — especially when annual miles traveled are high. When GHG emission reduction is most important, a plugin hybrid electric vehicle is the optimal solution over a wide range of annual mileage. At low annual travel range, all-electric vehicles are the best economic option. And, finally, as our electricity sources become cleaner — more wind, solar, and nuclear sources instead of coal — all-electric vehicles are the preferred environmental choice. Funded by this award through the NSF Innovations at the Nexus of Food, Energy and Water Systems (INFEWS) initiative, Cai will work with Roland Cusick, Assistant Professor of Civil and Environmental Engineering; Benjamin Gramig, Associate Professor of Agricultural and Consumer Economics; Vijay Singh, Professor of Agricultural and Biological Engineering and the Director of the Integrated Bioprocessing Research Laboratory; and Gregory McIsaac, Professor Emeritus of Natural Resources and Environmental Sciences and Senior Research Scientist at the Agricultural Watershed Institute. New research published by iSEE’s Critical Infrastructure and Transportation team recommends a new way to regulate how we deal with electricity generation during times when it’s really hot and/or during an ongoing drought. The relationship between a reliable electricity supply and the health of aquatic ecosystems is complex. When water is drawn into a power plant, it enters at one temperature but leaves a lot warmer after performing its cooling function during the power generation process. The extra heat the water carries when it rejoins its source is a form of “thermal pollution,” and it’s a big concern for ecosystem health. U.S. Environmental Protection Agency (EPA) rules cap the amount of thermal pollution power generators can put into the environment. But when a heat wave strikes, energy demand increases as lots of AC units are switched on. At the same time, the ambient water temperatures are going up, and the streamflow is going down. The ecosystem is stressed, and yet the power plants need to make even more electricity. Because a shortfall of energy cannot be allowed, the EPA grants “variances,” or permission to pollute more than usual, to the power plants. This usually happens retroactively, only after it is apparent extra pollution is going to happen. Plants submit requests for some leeway independently, with no communication between operators. Generally, everyone asks to keep producing at the same level, Lubega wrote, and so lots of extra pollution occurs. Lubega’s work claims that this isn’t the best way to go about providing energy — especially since it jeopardizes the environment. He instead looked at the system as an optimization problem: How do we get all the energy we need while minimizing environmental impact? He mathematically modeled the relationships between power plants and rivers, and between rivers and the atmosphere. The resulting computer model can receive information about a particular system of power plants and the water sources they’re relying on, then respond with best energy generation levels for each plant and the number of variances it actually needs. Research into the so-called “energy-water nexus” is becoming an increasingly important in the face of global climate change. Lubega and Stillwell suggest that proactive optimal rules for energy generation during drought or heat wave conditions could be integrated into regular power grid seasonal planning procedures as standard practice. “Rules developed in advance are straightforward for the relevant environmental agency to apply, and minimize uncertainty and associated financial risk for the various power system participants,” they wrote. Researchers are developing optimal thermal variance rules for different hydrological and meteorological conditions with an Illinois case study — and ongoing work for the country. Team members are identifying multiple tradeoffs between water quantity, water quality, and biofuel development through an Illinois watersheds case study (right). Researchers are jointly determining demand and pricing in the coupled power grid and transportation network to minimize the social cost of electronic vehicles. They are also assessing costs and benefits of strategies for reducing carbon emissions, and proposing economic incentives and policies to achieve low-carbon fuel greenhouse gas reduction targets. And team members are selecting optimal electronic vehicle options state-by-state in the United States through life cycle analysis. The dependence of the electric grid on water has been analyzed, using droughts and heat waves to develop generation operating points and constraints. The team has quantified the tradeoffs between profitability, food and fuel production, greenhouse gas (GHG) emissions and nitrate runoff reduction with different types of biofuels in the Sangamon watershed in Illinois and analyzed the optimal mix of biofuels as well as the policies that should supplement the mandate to achieve multiple environmental outcomes. Project researchers have modeled the load of EV charging stations in response to day-ahead electricity prices; the next step will be to incorporate EV load modeling as a demand response program into the electricity market. The team is continuing a study that found that on average, the total mining water used in U.S. oil/gas producing counties has increased by 62% since fracking expanded in the late 2000s; results suggest that the majority of additional water used was withdrawn from groundwater resources. And the team has developed a model used to examine the synergies and trade-offs generated by overlapping renewable energy policies in the transportation sector and their implications for the cost of GHG mitigation. Back row: Yanfeng Ouyang, Shaowen Wang, Kaiqing Zhang, Ashlynn Stillwell, Albert Valocchi, Ximing Cai, and Hadi Meidani. Front row: Jia Zhong, Madhu Khanna, Hao Zhu, Thomas Overbye, and Desiree Phillips. Ximing Cai, Lovell Endowed Professor of Civil and Environmental Engineering (CEE). His departmental page. His Ven Te Chow Hydrosystems Lab page. Madhu Khanna, Professor of Agricultural and Consumer Economics (ACE). Her departmental page. Yanfeng Ouyang, Professor of CEE. His departmental page. His Rail Transportation and Engineering Center (RAILTEC) page. Ashlynn Stillwell, Assistant Professor of CEE. Her departmental page. Her research group page. Her Ven Te Chow Hydrosystems Lab page. Shaowen Wang, Professor of Geography and Geographic Information Science. His departmental page. His Department of Urban & Regional Planning page. His School of Earth, Society, and the Environment (SESE) page. His National Center for Supercomputing Applications (NCSA) page. His lab page. Chao Lei, Postdoctoral Research Associate with CEE (not pictured). Zhe Zhang, Postdoctoral Research Associate with NCSA (not pictured). Hiroshi Matsushima, Ph.D. Candidate in ACE. (not pictured). Majid Shafiee-Jood, Ph.D. Candidate in CEE. (not pictured). His lab page. Grace Wackerman, Undergraduate, Electrical and Computer Engineering (ECE). Hadi Meidani, Assistant Professor of CEE. His departmental page. His Uncertainty Quantification Group page. Albert Valocchi, Professor of CEE. His departmental page. His research group page. His Ven Te Chow Hydrosystems Lab page. Thomas Overbye, original PI, former Fox Family Professor of ECE, now at Texas A&M University. Hao Zhu, former Assistant Professor of ECE, now at the University of Texas at Austin. Pouria Ahmadi, Postdoctoral Research Associate with iSEE (not pictured). Desiree Phillips, Ph.D. Candidate in ECE. Her departmental page. Kaiqing Zhang, M.S. Candidate in ECE. His departmental page. Publication: “Influence of Internal Variability and Global Warming on Multidecadal Changes in Regional Drought Severity over the Continental United States.” Apurv, T.; Cai, X.; Yuan, X. Journal of Hydrometeorology, Vol. 20, PP 411-429, March 8, 2019. Publication: “Analyzing the economic value of thermal power plant cooling water consumption.” Lubega, W.; Stillwell, A. Journal of Water Resources and Economics, Jan. 29, 2019. Presentation: “Revealing Auto Manufacturers’ Implicit Pricing Strategy under the Reformed CAFE Standard: A Reduced Form Approach.” Matsushima, H.; Khanna, M. Agricultural & Applied Economics Association (AAEA) Annual Meeting, Washington, DC, Aug. 3-5, 2018. Publication: “Hierarchical Decision-Modeling Framework to Meet Environmental Objectives in Biofuel Development.” Shafiee-Jood, M.; Housh, M.; Cai, X. Journal of Water Resources Planning and Management, Vol. 144, Issue 7, July 2018. Publication: “Dynamic Operations and Pricing of Electric Unmanned Aerial Vehicle Systems and Power Networks.” Zhang, K.; Lu, L.; Lei, C.; Zhu, H.; Ouyang, Y. Transporation Research Part C: Emerging Technologies, Volume 92, pp. 472-485, July 2018. Poster: “The Effect of Cooling Water Constraints on Loss of Load Probability.” Wackerman, G.; Lubega, W. N.; Stillwell, A. Best Poster Award at Power and Energy Conference at Illinois (PECI), Urbana, IL, February 2018. Publication: “Multicriterion optimal electric drive vehicle selection based on lifecycle emission and lifecycle cost.” Ahmadi, P.; Cai, X.; Khanna, M. International Journal of Energy Research, January 2018. Presentation: “Modeling Interdependent Transportation and Power Systems under Dynamic Supercharging Demand of Electric Vehicles.” Lu, L.; Lei, C.; Ouyang, Y. INFORMS Annual Meeting, Houston, TX, Oct. 23-25, 2017. Publication: “Maintaining Electric Grid Reliability under Hydrologic Drought and Heat Wave Conditions.” Lubega, W.N. ; Stillwell, A. Applied Energy, Special Issue in “Energy-Water-Food Nexus, pp. 538-549. July 2017. Presentation: “Hedging Thermal Power Plant Cooling Water Risk with Financial Instruments.” Lubega, W.N. ; Stillwell, A. World Environmental and Water Resources Congress, Sacramento, CA, May 21-25, 2017. Presentation: “Going Beyond the Blend Wall: Policy Incentives for Fuel Consumers to Supplement the Renewable Fuel Standard.” Zhong, J; Khanna, M. Agricultural & Applied Economics Association Annual Meeting, Chicago, IL, 2017. Presentation: “Analysis of Economic Criteria in the Creation of Realistic Synthetic Power Systems.” Phillips, D.; Xu, T.; Overbye, T. Institute of Electrical and Electronics Engineers Power and Energy Society Powertech Conference, Manchester, UK, 2017. Presentation: “Maintaining Electric Grid Reliability under Drought Conditions.” Lubega, W.N. World Environmental and Water Resources Congress, West Palm Beach, FL, 2016. Publication: “Mix of First- and Second-Generation Biofuels to Meet Multiple Environmental Objectives: Implications for Policy at a Watershed Scale.” Housh, M.; Khanna, M.; Cai, X. Water Economics and Policy, World Scientific, 2015, doi: 10.1142/S2382624X1550006X.